In early December, we put out a call for nominations to recognize historians or projects that model the practice of Active History. We received several nominations, all of which were deeply engaged in a responsive historical practice that aimed to make a tangible difference in people’s lives. Though selection was difficult, two submissions stood out to the adjudication committee. In the category of notable submissions to ActiveHistory.ca, the committee found Crystal Gail Fraser and Sara Komarnisky’s 150 Acts of Reconciliation especially worthy of recognition. Rather than using our traditional essay format, Fraser and Komarnisky’s contribution to ActiveHistory.ca was formatted as a succinct list of daily tasks to help cultivate a culture of Truth and Reconciliation. Their list provides a wealth of resources, insights, reflections, and recommendations aimed at helping settlers better understand and grapple with their roles in the Canadian settler colonial nation-state. As such, it is one of our most read submissions, with about 50,000 unique views. 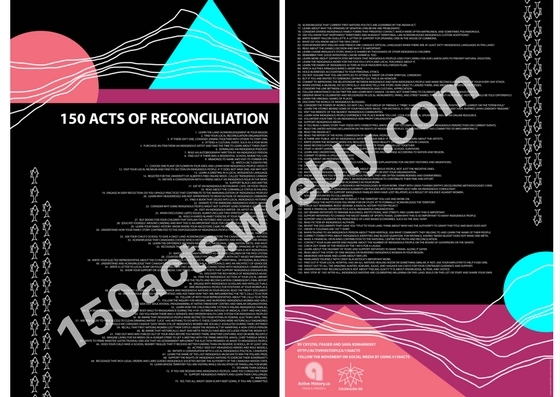 With its obvious uses for educators, activists, and citizens, 150 Acts of Reconciliation represents the very best of Active History: engaged writing that brings historical knowledge to a broader audience, in the process enriching understanding of contemporary issues. In the category of exemplary practices of Active History, the committee felt that Lilian Radovac’s Alternative Toronto project was most deserving. Alternative Toronto is an archive and exhibition space that documents the history of radical, counter cultural, anti-racist and trans/feminist/queer activism in Toronto between 1980 and 1998. Unlike similar projects, Alternative Toronto consists of digital items (flyers, videos, posters, zines) that were uploaded by people who were there and carefully kept in homes and storage units as personal archives. By involving unions, advocacy groups, activists, artists, and others in the archiving process, this project has established a laudable model for participatory, community-engaged research. In doing so, Radovac’s digital archive demonstrates how community outreach and collaborative practices can create a new type of grass-roots, accessible and innovative archive. The project is actively recruiting new contributions and – if you are in the Toronto area – will be holding an event this Wednesday (Feb 27 2019) at the Art Gallery of Ontario. Two additional nominations are worthy of mention. Christo Aivalis, one of our editors, was nominated for his work in the media. In addition to conducting television and radio interviews, Aivalis’s work has been published on the Globe and Mail, Canadian Dimension, MacLean’s and Washington Post. Our francophone partner site HistoireEngagee.ca was also nominated. In both cases, the editorial collective and the awards committee felt it would be inappropriate to consider these nominations for awards due to their close involvement with the Active History project. That said, we want to recognize them for the important contribution that they make to cultivating a practice of Active History and acknowledge that others see their work as worthy of this type of recognition. Taken together, each of these projects challenge us, through critical community-engaged history, to recognize the ways in which historical exclusions continue to structure our Canadian present. As an editorial collective, and on behalf of the editorial collective, we wish each of these historians our hearty congratulations!